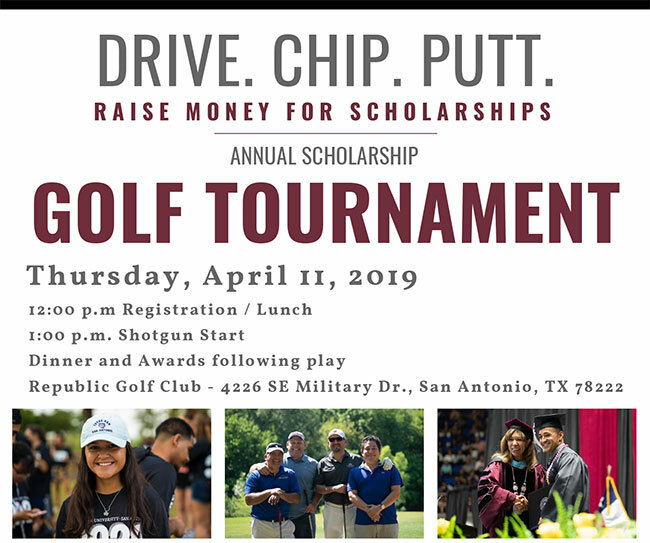 Registration is now open for the 2019 Texas A&M University-San Antonio Foundation Scholarship Golf Tournament scheduled for Thursday, April 11th at Republic Golf Club! Registration includes - 18 Holes of Golf, Golf Cart, Driving Ranger access, Gift Bag, Beverages, Lunch, Dinner and Awards, Long Drive, Closest to the Pin and Hole-in-One contests. Our golf outing was created to help generate scholarship support for qualified well deserving A&M-San Antonio students. Since the Foundation’s inception, it has partnered with the University to raise more than $12.9 million in philanthropic support. During that time, the Foundation has awarded scholarships to more than 5,500 students. Thanks to increased interest and generous community support, the 2018 Scholarship Golf Tournament was the largest and most successful tournament to date. We anticipate a sellout and strongly recommend that you confirm your 2019 level of support today! We are excited to introduce new sponsorship opportunities that will enhance your experience while providing your organization a valuable and deeper association with A&M-SA. Please CLICK HERE to review all sponsorship opportunities. Sponsorships are tax-deductible and all proceeds from the tournament will be used exclusively for scholarship funds. Please contact Anthony Medina for more information about sponsorship opportunities, donations and registration. Please click on the following link to view 2018 golf tournament photos.